We are delighted to announce the appointment of our new executive director and three new board members. Jolene Jennings was named permanent executive director of the nonprofit after serving in the interim role for six months. Jennings, who has a master’s degree in nonprofit management from Worcester State University, has 20 years of experience in the Greater Worcester nonprofit sector. We also voted in three new board members for three-year terms: Melissa Depanian, a senior marketing manager at EnerNOC in Boston; Frank Callahan, director of planned giving at Worcester Academy; and Amanda Addeo, a disability benefits specialist at Unum Group. 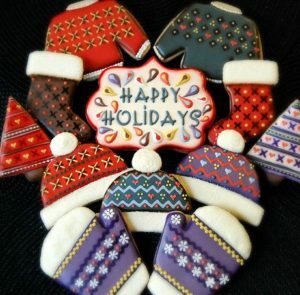 Literacy Volunteers will hold their First Holiday Bake Sale and Exchange on Tuesday, December 13th, from 12:30-2:30 pm in the Banx Room of the Worcester Public Library. Please join us in celebrating the traditions of our diverse cultures this holiday season over coffee and baked goods. 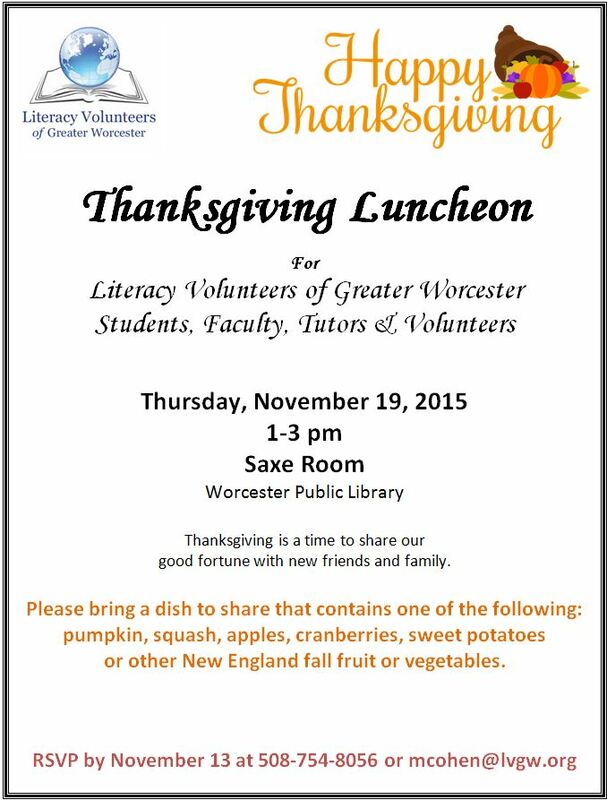 Our students, teachers, tutors and all those interested in learning more about Literacy Volunteers are invited. The Bake Sale table, an American tradition, will also have baked goods for sale to take home. All proceeds benefit Literacy Volunteers programs. Contact Melissa or Sheila at info@lvgw.org to register to attend, volunteer or bring a baked good. You can donate individually wrapped baked goods with holiday recipe attached the day before event on Monday, December 12 from 10am-2pm. 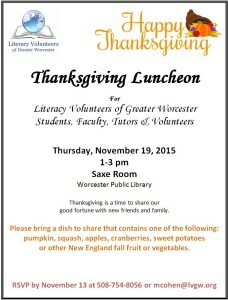 Drop off at Literacy Volunteers office at the library, Suite 332. Our next tutor training session is scheduled for January, 2017. Registration is now open! The training consists of six sessions totaling 18-hours and will be held on January 10, 12, 17, 19, 24, and 27th, from 3:30 p.m. – 6:30 p.m. This training prepared you to start one-on-one tutoring with our ESL students. Seating is limited-please pre-register by Friday, January 6th. If you would like to volunteer and be considered for a tutor position please download and fill out this application and send to info@lvgw.org. Annual International Potluck Lunch with In-Service prior this Wednesday, June 8th. In-Service for tutors and faculty prior to the Potluck from 11:30-12, Nancy LaCrosse will discuss the MCAE Conference. The International Potluck Lunch for Students, Tutors and Faculty is Wednesday, June 8th from 12 – 1 pm in the Banx Room at the Worcester Public Library. Please bring your favorite entree, side dish or dessert to share! This is a fun annual event, and a chance to catch up and socialize and it all happens during Worcester celebrates “Reading as a City” week!Invite your students! RSVP to Sheila appreciated at info@lvgw.org. Great article written by our own Harvey Fenigsohn! Harvey has been volunteering with us since 2004, and we’re so grateful for all that he’s done. This article appeared in GoLocalWorcester.com’s lifestyle section.